Agile Fountains screen saver displays beautifull water scenes (some are real, some are the computer fantasy) with animated dancing fountains. Relax with the water scenes and delightful fountains shapes. It not only are extremely nice to look at. But also if youa??? ?d like to lift your spirit with some calm and relaxing animations screensavers can definitely be just what you are looking for. 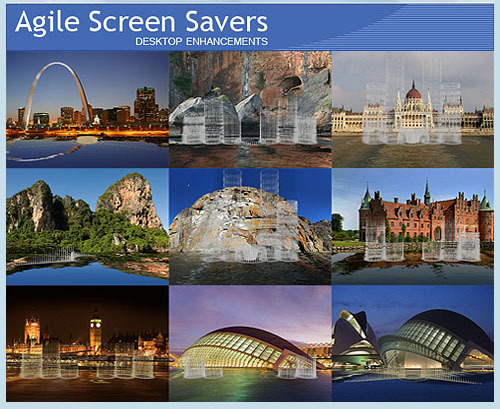 ...... Today, screensavers don't serve their original purpose and are primarily used for entertainment. In fact, we don't need screensavers any more, however we tend to use them as eye-candy for our coffee breaks. Particularly complex and colourful 3D-screensavers are extremely nice to look at. But also if you'd like to lift your spirit with some calm and relaxing animations screensavers can definitely be just what you are looking for. Rotate the stage and lead the ball to the goal! Six addictive puzzles, from the Lines and other brands to the new best-sellers! Video software in converting video to AVI (AVI,DivX,Xvid). Convert video between popular formats and rip DVD to video file. A Stand Alone Reminder Program That Gets The Job Done ... Professionally. The most popular video software for splitting AVI, DivX, Xvid, MPEG, MPG, WMV. Qweas is providing links to 100 Agile Fountains 1.1 as a courtesy, and makes no representations regarding 100 Agile Fountains or any other applications or any information related thereto. Any questions, complaints or claims regarding this application 100 Agile Fountains 1.1 must be directed to the appropriate software vendor. You may click the publisher link of 100 Agile Fountains on the top of this page to get more details about the vendor.